DISCLAIMER: The star rating for this review is more irrelevant than likely ever before. In the 30+ years since its release, a lot of things have been said about Mommie Dearest, and many of them shouldn’t have been said. It’s come to that point where the legacy has outweighed the origin, sort of like Joan Crawford herself. The film is one of the few that is synonymous with camp these days, to the point where the ironically beloved line “No wire hangers ever!” has entered the American Film Institute’s list of the 100 greatest movie quotes of all time, the center piece of a scene so unbelievably inflated that I’m not sure if anyone would believe it was real if someone simply described it to them. But it is real, and with its cutesy-shlocky Razzie sweep in check, there comes a time to wonder if it’s even physically possible to impartially view Frank Perry’s film. 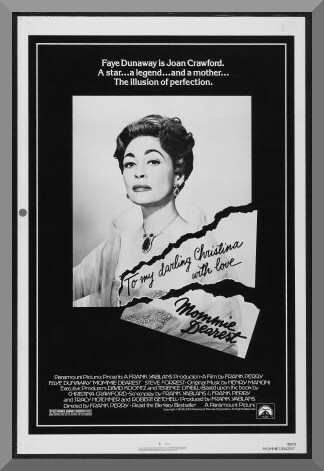 For the seven of you unaware of what Mommie Dearest entails, it’s an adaptation (in apparently the loosest sense of the term) of Christina Crawford’s 1978 memoirs of the same name, which entail stories of her childhood onwards, and an emphasis on her relationship with her mother, Hollywood icon Joan Crawford, who had died the year prior to publication, because nobody with the slightest amount of care for their safety would publish an ill word about Joan Crawford while she was still alive. In the book, Crawford lays forward allegations that her mother physically and emotionally abused her, a set of severe accusations which Joan’s friends and family have long debated the merits of. In the film, Christina is played by Mara Hobel as a young child and Diana Scarwid as both a teenaged and adult version. Joan is played by Faye Dunaway, in a performance that is considered either an over-the-top explosion destined for historical preservation due to its unbelievable ridiculousness or a shatteringly accurate representation of a woman who was deeply mentally disturbed. The jury is still out. My armchair psychiatric diagnosis is that Crawford, at least through Dunaway’s and the film’s depiction, suffered from bipolar disorder or personality disorder, or a combination of those or some other behavioral condition. Or maybe that’s the film’s choppy writing and editing – scenes in which Crawford doles out abuse on her young daughter are often sandwiched by scenes in which she acts entirely normally, and there’s usually little-to-no transitional period between the two. For example, the joyous moment that depicts Crawford winning the Oscar for Mildred Pierce in 1946 is immediately followed by the infamous wire hangers scene. We don’t know if this is supposed to have happened later that night or long afterwards, making Mommie Dearest an often jarring 128 minute viewing experience. Or alternately, was that Perry’s intent – ultimate unpredictability, creating an uneasy feeling simulating Christina’s experiences? The world may never know, because Frank Perry died in 1995 and Faye Dunaway refuses to discuss the film to this day. I can’t say I blame her – history has generally been very sarcastic and unkind to her for her involvement. The main issue with Mommie Dearest is that it never sets up a rhythm or intent to operate on, where events and moments are compiled together, thankfully in at least a chronologically sensible way, but then left to roll along on each other, like a row of dominoes where each piece came from a different box. Whatever your stance on Mommie Dearest – that it is a simply miserable failure, a cheesy ironic classic, or a genuine classic – it’s hard to deny the deadly serious vein that runs through every second. In a way, that fuels the fire on those who embrace the so-bad-it’s-good rhetoric, in that every enduring camp staple has never started out with such an end goal in mind, which sets them apart from exceptions to the rule like the collective Sharknado franchise. Mommie Dearest, and Dunaway’s acting in particular, are disproportionately theatrical, but not to the point where any genuine dramatic effect is entirely absent. There is artistic professionalism present, and when it does come out, it dispels the notions that the movie is beyond saving. In 1982, the Golden Raspberry Awards, then in their infancy, bestowed upon Mommie Dearest a grand crown of “prizes” – Worst Picture, Worst Director for Perry, Worst Actress for Dunaway, Worst Supporting Actress for Scarwid (and two other performers for the film were nominated), Worst Supporting Actor for Steve Forrest, who plays one of Crawford’s many significant others, and Worst Screenplay. Would it be accurate to call this tidal vote an overreaction? There’s hardly anything awful in Forrest, I would opine, but his material is largely secondary to Dunaway and Hobel as Young Christina (also nominated in a turn that is both unsurprising for such a Razzie sweep celebration and vaguely mean spirited for a ten year old girl in her first feature film, playing an abused child). This result from the grandmasters of cinematic gag gifting is the cherry on top of the monstrous reputation that the movie will likely carry with it for a long, long time. But after viewing it, I can’t really say it’s that awful. There are indeed sequences where Dunaway chews the scenery so ruthlessly that you’re amazed there’s anything left by the end, but maybe that’s less attributable to the actress than to Perry, as a director, not telling his performers to reel it back. And there are scenes that are poignant and effective, although they are the very few occasions in the entire movie where the character of Joan Crawford is absent, but this also proves my theories that it was the unchecked nature of Dunaway’s acting that fail the seriousness of many moments and that the movie was not irreplaceably incompetent. It’s certainly far from perfect, but I can’t imagine Mommie Dearest is the Worst Picture of the 1980s. Come on, guys. I can see why Faye Dunaway would refuse to discuss this film to this day. It’s hard to see her now without thinking of her portrayal of Joan Crawford. I for one thought she was amazing, and if the story is to be believed, it is a shocking exposee below the shiny veneer of a Hollywood legend. And in fact, I can’t view Joan Crawford films the same way anymore after seeing Mommie Dearest. This is one of the films that, any time it comes on TV, I set the remote aside and watch to the end. And one final thought, how appropriate the final line in the film, Scarwyd’s deadpan (when her brother Michael says “Well, she got the final word”), “Did she?” An ominously sinister period at the end of the book that was Joan Crawford’s life. Although I wouldn’t give it 4 stars, I might venture into 3-star territory.